Our office is located on the property of St. Andrew Roman Catholic Church inside of the Family Life Center. The Society of St. Vincent de Paul (SVDP) includes a group of volunteers of the parish who offer tangible assistance to those in need on a person-to-person basis. This assistance is offered to members of the Channelview area (living in zip code 77530, 77015, 77049, 77013, 77029). This aid may take the form of intervention, consultation, or often through direct dollar or in-kind service. For additional information, please contact the SVDP office at 281-457-2245 or via email at svdp77530@gmail.com. San Vicente de Paúl La sociedad de San Vicente de Paúl incluye un grupo de voluntarios de la parroquia que ofrecen ayuda tangible para aquellos que necesitan una ayuda más personalizada. Esta ayuda se les ofrece a los miembros del área de Channelview, que viven en el código postal 77530, 77015, 77049, 77044, 77013 and 77029. La ayuda puede tomar forma de intervención, consulta personal, o frecuentemente a través de ayuda económica. Por favor llame a la oficina al 281-457-2245 para más información. 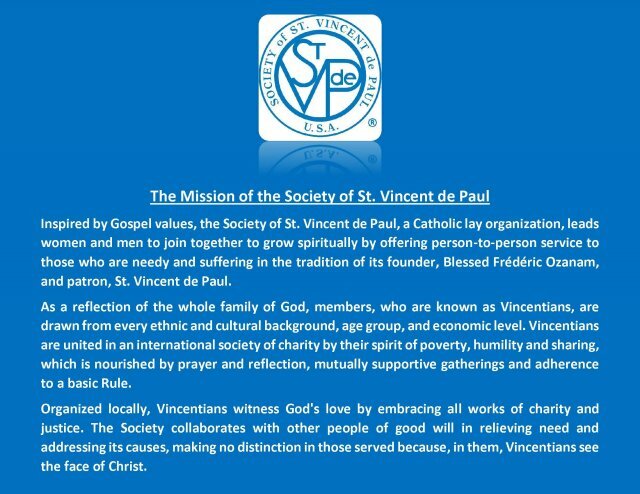 Who is the Society of St. Vincent de Paul? Are you interesed in answering the call to serve by working as a Vincentian? The focus of the Society is the spiritual growth of its members through service to others. Service to others takes many forms in our society: seeing clients in our office, or at their homes, assisting clients in our food pantry, receiving deliveries from the Houston Food Bank, general office work to keep our society functioning and our records accurate, calling clients and listening with a friendly ear.